The Condition of the above obligation is such, That whereas the above bounden Branch Tucker hath made application for a License for a marriage to be celebrated between him and Lucy Blakey of the county aforesaid Now in [illegible] it shall not appear hereafter, that there is any lawful cause to destruct the said marriage, then the above obligation to be void, otherwise to remain in full force and virtue. I had the date and place for this marriage, but it was unsourced. Thanks to @editor1130 for sending me this marriage license! 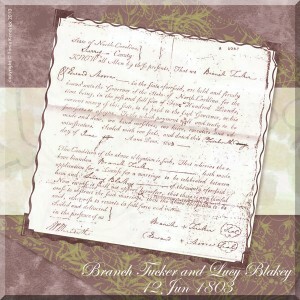 In reviewing my information for Branch Tucker, I see that he was about 48 years old at the time of this marriage. This would be unusual for a first marriage, so I should look for a prior marriage for him. It was also interesting to compare the boilerplate in this license to that of Branch’s son, Churchwell Tucker, who was married in North Carolina twenty-five years later.